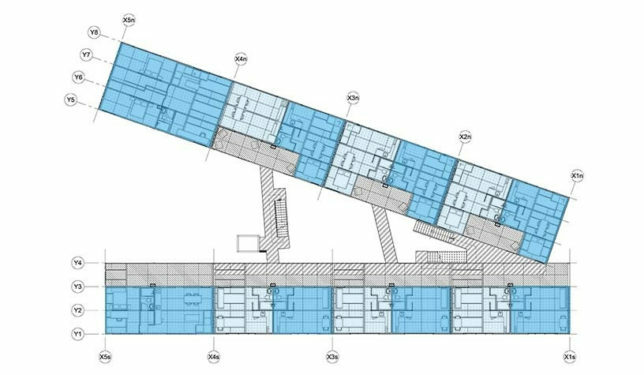 Drivelines Studios is a low-rise residential apartment building in Johannesburg, SA, constructed from 140 re-purposed metal shipping containers. Drivelines Studios is a residential building like few others… and that’s by design. The roughly triangular, seven-story low rise fits neatly into an odd-sized lot in Maboneng, an area of JoBurg enjoying a spurt of urban renewal. 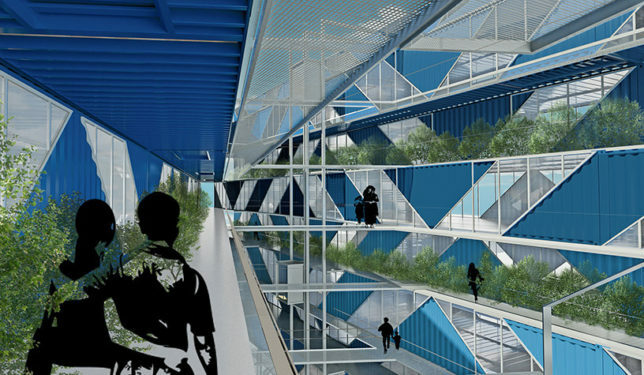 According to New York-based design studio LOT-EK, Drivelines Studios “responds to the post-apartheid generation’s desire to repopulate the city’s downtown through new models of urban living.” The model may be new but the materials are not: 140 recycled and re-purposed steel shipping containers form the building’s internal and external structure. 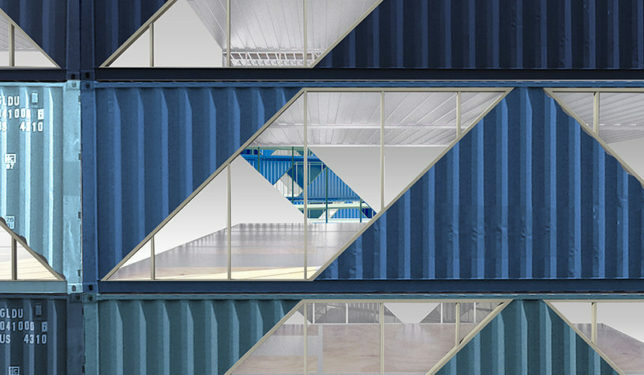 We’ve featured shipping container projects by LOT-EK before (here and here), but the 75,000 sq ft Drivelines Studios project is their largest such effort to date – it’s also South Africa’s largest residential shipping container project. Costs were managed quite creatively. For example, the upcycled metal container boxes were organized by color and their exterior surfaces were left unpainted, ultimately determining the building’s outward appearance. 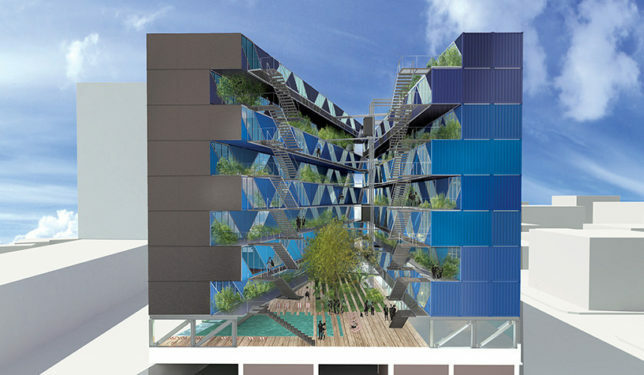 During the course of construction, the containers were trimmed and assembled on-site with preordained combinations of containers forming distinct living and working spaces. One common theme is the large diagonal cut-out angled from the corner to the center of each container’s long side. This cutting style resulted in large windows offering grand views of Albertina Sisulu Road ( a major arterial thoroughfare) on one side and the building’s inner courtyard on the other. Once assembled and stacked together, the trimmed containers present a repeating and mirroring pattern on the building’s facades. 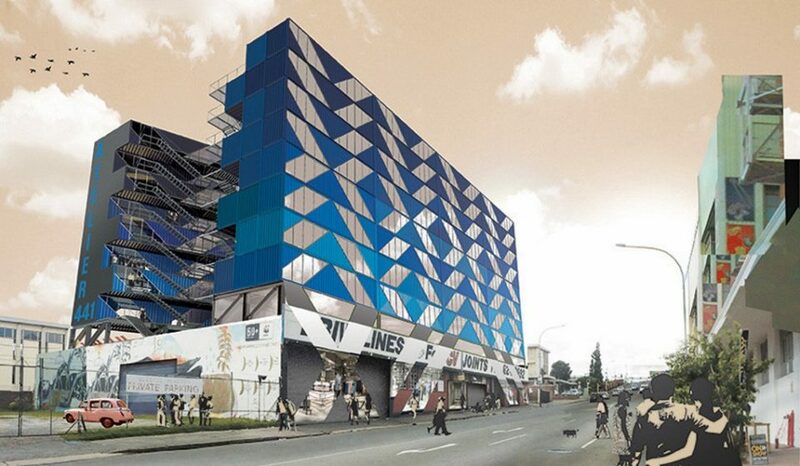 Drivelines Studios is a seven-story tall low rise building. The ground level first floor features residential units at the rear, allowing a mix of small retail spaces opening onto Albertina Sisulu Road. Moving inward, a private landscaped courtyard offers residents a soothing urban green space highlighted by a swimming pool. 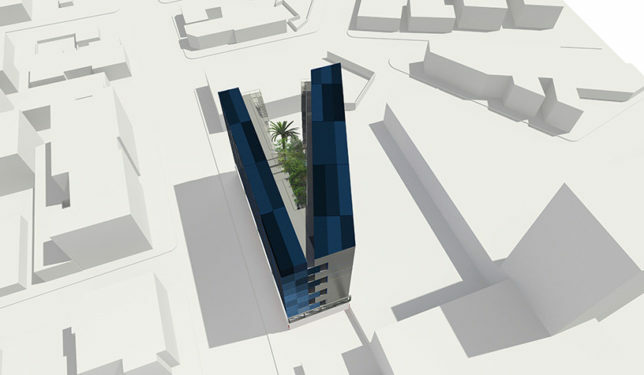 All six levels above the ground floor feature residential units only. These open-plan studio apartments provide from 300 sq ft to 600 sq ft of living space, with each and every unit having an open “balcony” space facing the inner courtyard and the network of walkways. 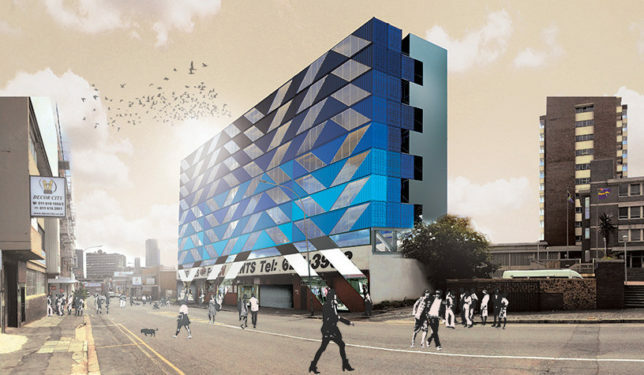 “The building’s social intention and agenda is in line with the emerging urban community of its surrounding neighborhood,” states LOT-EK, “taking an active role in the revitalization, reactivation and re-imagining of the city’s downtown.” Some historical trivia: the building’s footprint was once occupied by an auto repair and service shop called “Drivelines”, from which the development derives its name. 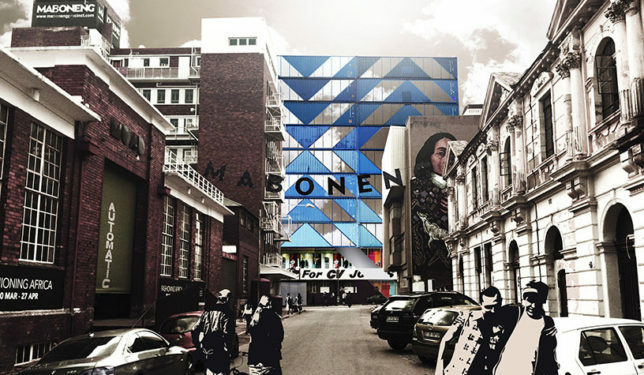 Not everyone is thrilled with the emergence of Drivelines Studios, however, as some see the project as fueling gentrification in Maboneng and the low-income Jeppestown neighborhood. Jonathan Liebmann, the founder of project developer Propertuity, takes such criticism in stride. “Four years after we started work in Maboneng, we decided to focus on delivering affordable residential accommodation in anticipation of market demand,” explains Liebmann. “In Maboneng, the average rental has been about the equivalent of $330 per month but we foresee this decreasing to around $230 over the next couple of years.” Time will tell, of course, but in the meantime we’ll just have to… contain ourselves. All images via Flickr member Jorge Andrés Calderón (Aireos) under a Creative Commons license.